About six months ago, we discussed how to remove all native Modern UI apps from a Windows 8 installation without the help of third-party tools. The method involves executing a command from the Command Prompt and is fairly simple. The only downside of the method is that you need to execute separate commands one-by-one in order to remove specific apps from Windows 8 installation. 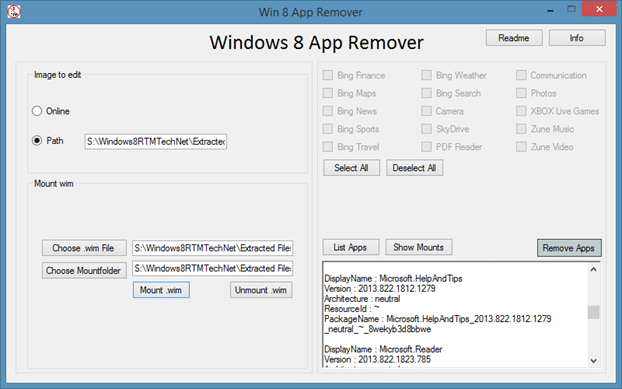 Windows 8 users who are looking for a better method to remove native apps from Windows 8 installation can now download a free utility called Windows 8 App Remover. With Windows 8 App Remover you can not only remove native apps from Windows 8 installation but also from Windows 8 .WIM image, meaning that you can remove Modern or Metro apps from Windows 8 setup file even before installing Windows 8 on your PC. 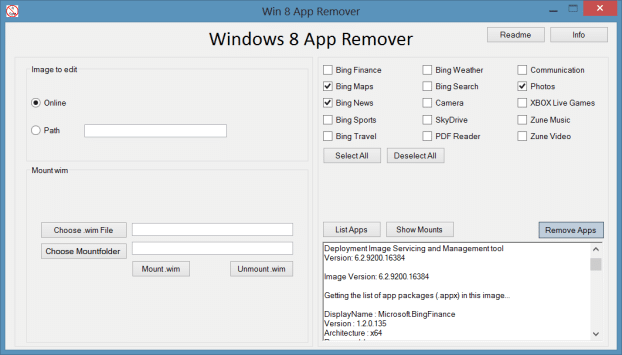 Windows 8 App Remover lets you remove almost all the apps that ship with Windows 8, including Bing Finance, Bing Maps, Bing News, Bing Sports, Bing Travel, Bing Weather, Bing Search, Camera, SkyDrive, PDF Reader, Communication, Photos, XBOX Live Games, Zune Music and Zune Video apps. You can either remove specific apps or all apps. This app is currently only compatible with Windows 8 and doesn’t help you remove all apps from Windows 8.1 installation. WARNING: Please note that once you remove apps using this method, you can’t reinstall them. In order to reinstall removed apps, you have no option but to reinstall or reset Windows 8. Step 1: Download Windows 8 App Remover from this page and run the program. It’s a standalone utility and you can run without having to install it. Step 2: Once the tool the launched, Select Online option (see picture) if you want to remove apps from your Windows 8 installation. And if you want to remove apps from your install.wim file, follow the instructions in method 2. Step 3: Click List Apps button to list all installed apps. Step 4: Select the apps you wish to remove and then click Remove Apps button to remove selected apps from Windows 8 installation or Install.wim file. If the above method is not working for you, we suggest you follow these instructions. 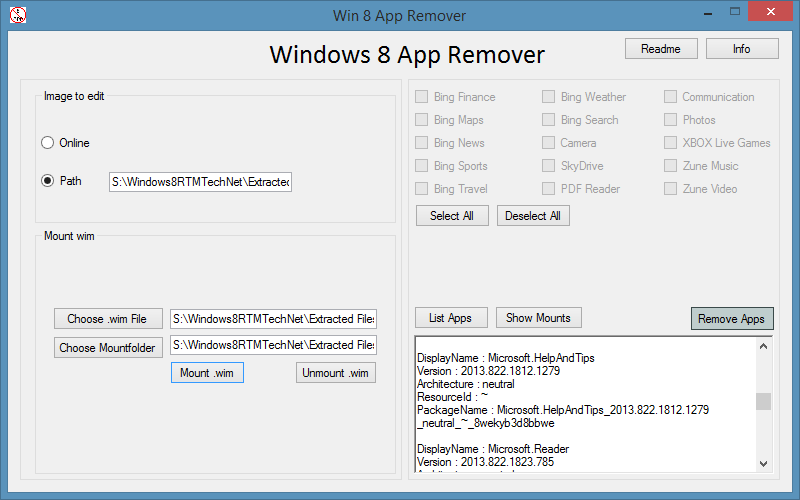 Step 1: Download Windows 8 App Remover by visiting the above mentioned link. Run the program. Step 2: Under Mount wim section, click Choose .wim file button to browse to the Install.wim file located in the Sources folder of Windows 8 installation files, and then click Choose Mountfolder button to select a folder to mount the Install.wim file. Depending your PC’s hardware, this process might a few minutes to hours. Step 3: Click Mount.wim button. Once the file is mounted, Windows 8 App Remover will automatically set Image to edit option to Path and right folder path that you have mentioned in Step 2. Step 4: Select the apps that you wish to remove and then click Remove Apps button. Step 5: Click Unmount .wim button to unmount the Install.wim file. That’s it!